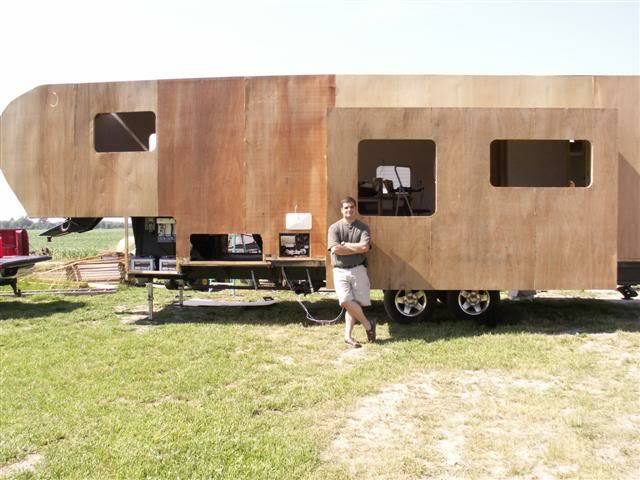 This man and his wife made a DIY fifth wheel travel trailer with their bare hands. 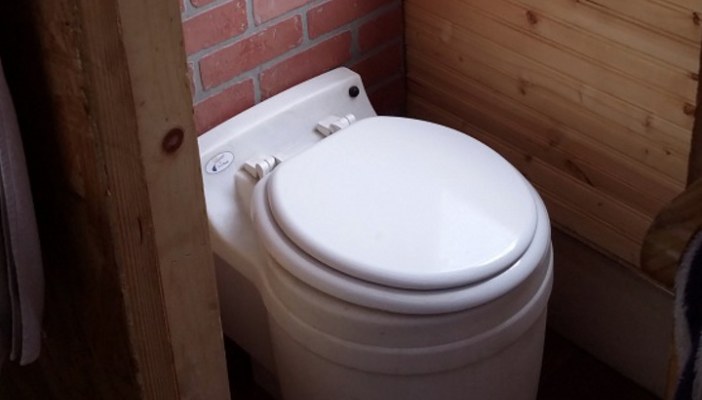 It's even got a working slide out. 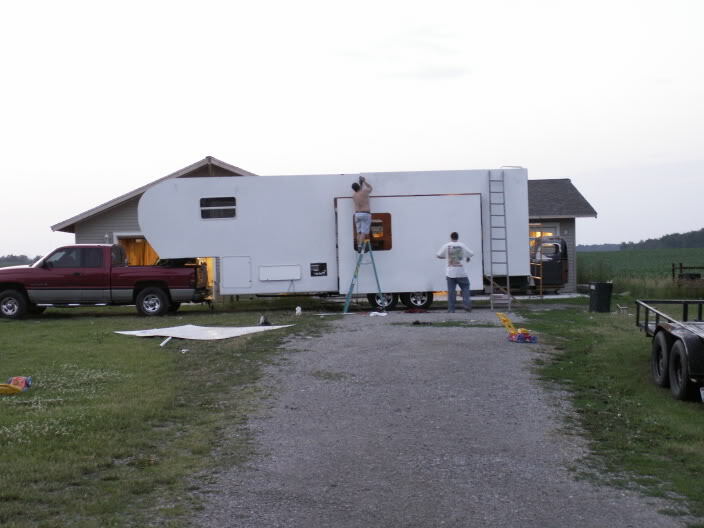 This is a story of a family of four doing the unthinkable and incredible: building their very own DIY RV 5th wheel travel trailer. 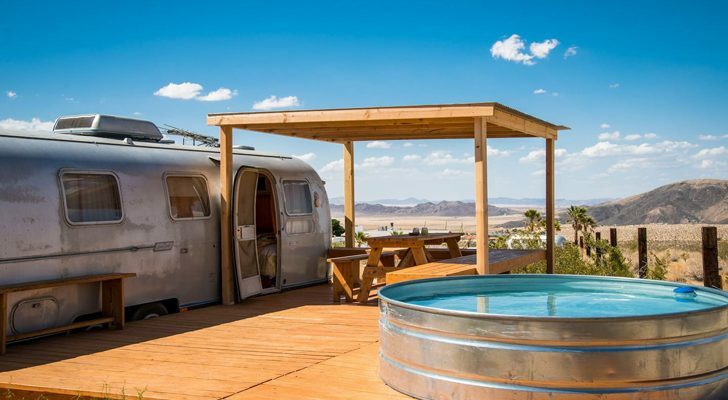 We’ve all seen custom DIY trailers and motorhomes – but you’ve probably never come across one that looks like it just rolled out of an RV manufacturer’s assembly plant. Chad and his wife Melissa completed the project several years ago. It’s amazing when you think about the time and effort that goes into sourcing the parts, fabricating the trailer, and putting together all the finishing touches. 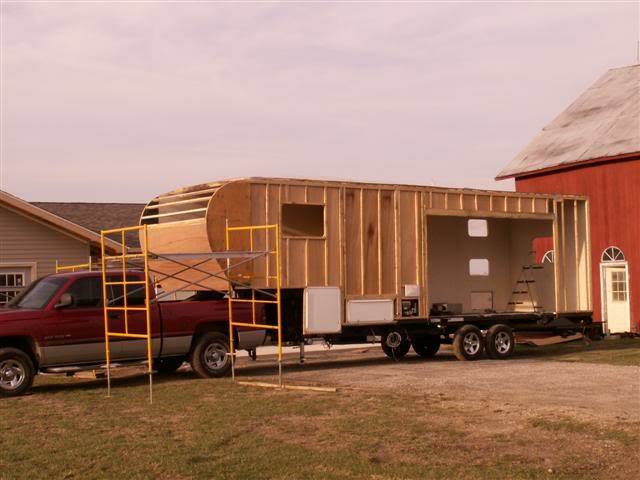 The couple completed the rig for under $10,000 in materials. When finished, the custom 31′ fifth wheel had a functioning slide out and 6 flat screen TVs. It’s humbling to see such a talented craftsman at work – and all the more unbelievable to learn that Chad was only 32 years old when built the RV, and he had a young son and family to look after at the same time! Chad’s rig features a homemade, function slide out. You can learn more about how he built it here. Chad no longer maintains a website with information on the build, but he did make a couple of videos about the project which you can watch beneath the next few pictures. Chad posing in front of the trailer after installing the outer paneling. Putting the finishing touches on the rig. Time-lapse of the fifth wheel build. Interview with Chad and his wife Patricia, the minds behind this amazing custom fifth wheel. 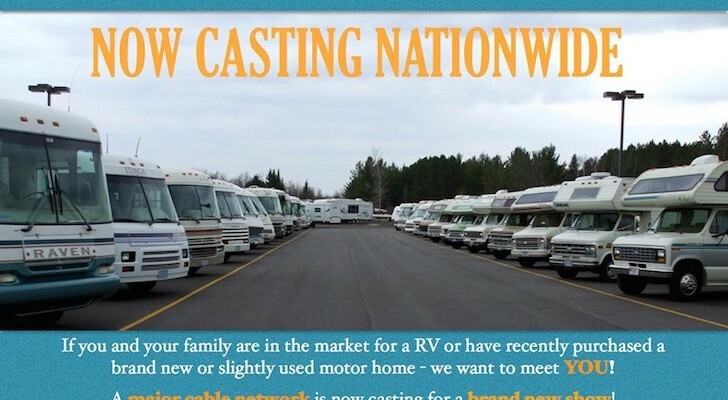 RVTV: We all like to walk around campgrounds and look at the different rigs. 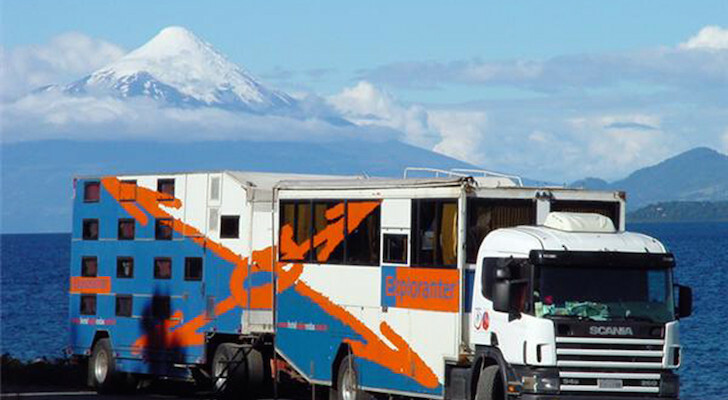 And I can usually spot every kind of manufacturer of fifth wheel travel trailer motor home. Every once in a while, you come across something that you just can’t place. And today we found one. Couldn’t place it because Chad Nicholls and his wife Patricia built it from scratch. Let’s find out more. Well, we’ll start out by welcoming you, Chad and Patricia, to RVTV. And the reason we’ve come here to visit you is because you’ve done something a little bit unique, and some might say crazy. This fifth wheel behind us, you built from scratch? RVTV: We’ve heard a lot of DIY projects, but building a fifth wheel from scratch, you’re probably maybe one of one people? Tell me how these all started. Chad: Well, we had had a ’73 Terry. 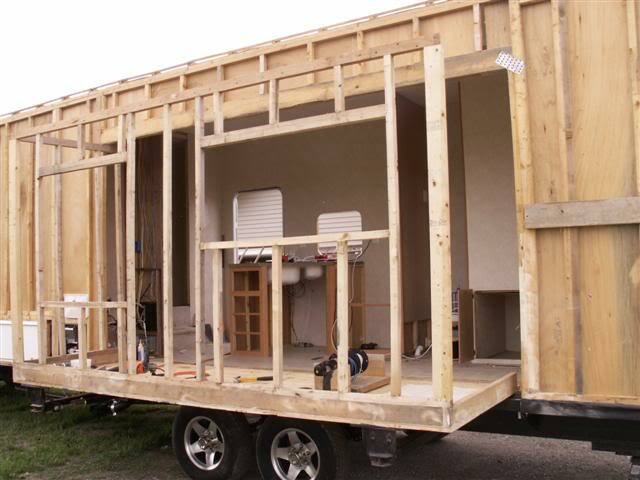 It was an old travel trailer I think of the 23 footer, and we gutted it down to basically the studs and remodeled it. 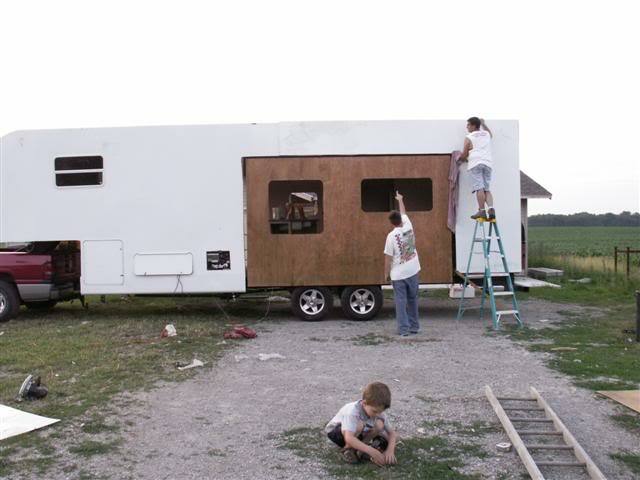 And as I was pulling the paneling off and seeing how it was built, I’m like, “You know there’s really not a whole lot to this.” And so after we had started living in our RV a lot in the summer, she was telling me it was too small. 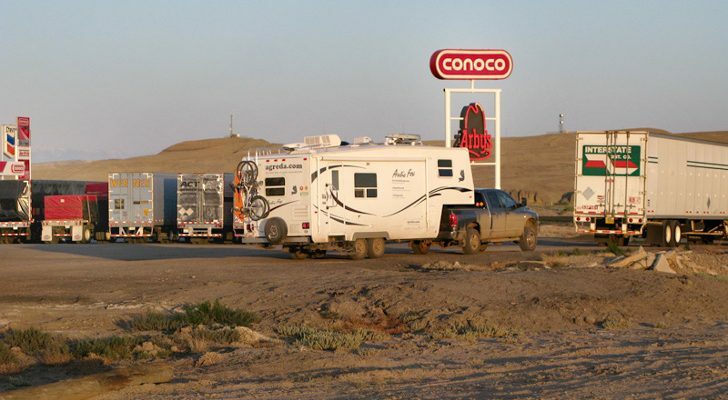 So I said, “Well, it’s time for a bigger rig.” And we looked around at other campers, didn’t see anything that really fit us exactly what we wanted. And in getting parts for the other camper, I knew where to get them. So I went ahead and thought, “Well, why don’t we just build our own? All the parts are right here and they are not really that expensive.” And that’s what we started to do. RVTV: How long did the process take? Chad: It took about a year. RVTV: About a year in weekends? Chad: Off at weekends and evenings. It wasn’t by any mean a full time undertaking. It was something we wanted to do slowly. 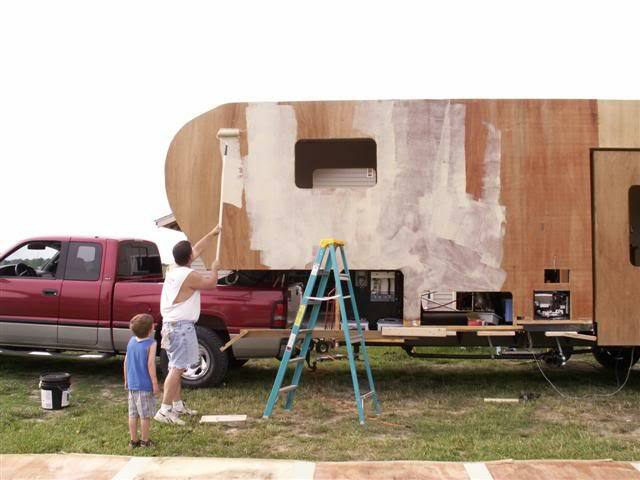 RVTV: But now looking at this unit, you don’t really get the impression that it’s homemade. I’ve seen some homemade campers, and they kind of look homemade. Chad: Well, that’s kind of the ultimate goal. I didn’t want something that you pulled in and everybody was like, “The Clampetts came to town.” I wanted something that would blend in and look natural. I had to put a little sign out there so people would know that it was homemade. RVTV: Again, the key was suiting your needs. RVTV: Now, you’ve got three kids. RVTV: And what are their ages? Chad: Six, three, and ten months, so just under a year. RVTV: So with each additional child, the RV gets smaller, right? RVTV: But tell me about what you’ve got in there for sleeping accommodations and to keep them entertained. Chad: We went ahead and went with a bunk house in the back. And I’m an IT Director so technology is easy to come by for me, and I had to make it geeky. So for entertainment, there’s a centralized computer, and all of our DVDs and music are all ripped to the PC. And there are six flat screens that are in the camper itself. The kids have their own eight-inch flip down screens in their bunks. They also have a DVD player and a TV tuner. So they could watch regular TV. If they want to watch a movie, they can watch that. Or if they want to watch content off the server, they can do that as well. RVTV: Now, Tricia, you were not just a passive bystander to this project. RVTV: You actually got your hands dirty. Patricia: I still remember insulating and it was about in July. It was just hot and you get insulation stuff on your skin. And, yeah, you remem-, you have lost all the memories. RVTV: No, it’s got your heart and soul in it. 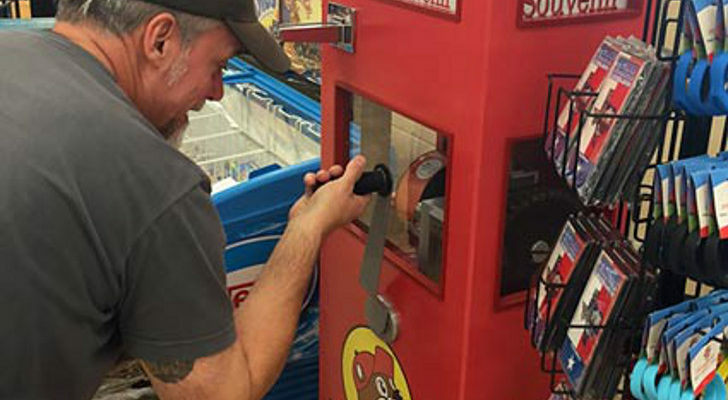 RVTV: I bet you’d never sell it. Chad: No. Not at all. RVTV: It’s certainly an accomplishment to be proud of. I’m sure RV manufacturers spend countless hours and years developing their models and their prototypes and designs, and you just went ahead and did it off the top of your head. Chad: A lot of people say, though, “How do you accomplish such a huge project?” I look at it. It’s not one major project, it’s a thousand little ones. And you had to be flexible. I had the design that we really wanted, we talked about, and we looked at, and we said, “Okay, this is what we’re going for.” But as we’re building it, it’s like, “Well, you know, hey, I never thought about it, but I could build a TV into this wall and save space. Or I can put a cabinet here or cut a cubby here.” You have to be flexible, and that’s the important part. RVTV: I guess one of the other advantages too is for somebody who is buying an RV that’s made by a manufacturer, you get a manual. And if you’ve got problems with something, you got to go through the manual, take it back to the dealer, and try and get it fixed. But you can fix everything on here. Chad: Yeah, the dealer and I don’t have too many arguments. RVTV: How is your warranty? Is it a lifetime warranty? Chad: My warranty is a lifetime actually, yeah. RVTV: Well, that certainly stands out in the industry, doesn’t it? Chad: Parts and labor, yeah. 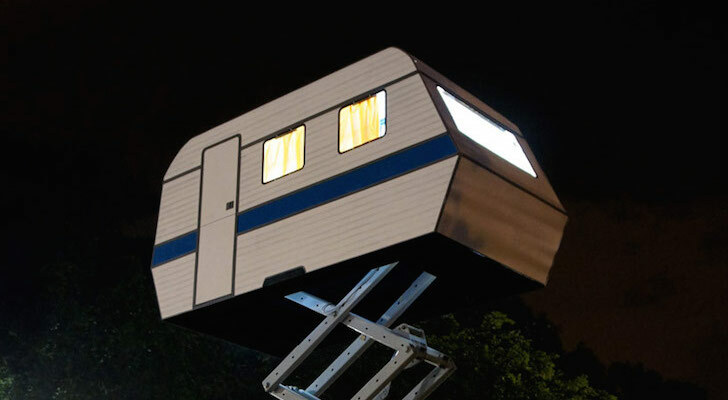 But, yeah, I know every square inch of the camper, which is I would say a pro and a con because I don’t have anybody to blame if something goes wrong. But then again I know pretty quickly how to fix it. The Nicholls: Hi, we’re the Nicholls and you’re watching RVTV. The geek side of me is interested in the IT side side of the project. I would love to get a better idea of how to did the system side of things. And a thousand points if you did the system using Linux on the back end. I have been doing Plex to provide content via wireless, but it is not clean. Currently, I am doing a pull 30 Shasta, but the next move that I make will be a Bunkhouse (I only have one son), and would like to get something in line with what you designed. Thanks so much for stopping by. Sorry to hear about your site, but at least your vision lives on. Let us know if you would like anything added to the article. This is my RV, built in 2006 and still in use today @ Jellystone Park in Freemont, Indiana. Thanks for the positive article, my site was hacked several years ago and I never was able to recover it. To be honest, it was very hard to keep up with the emails I would get on a daily basis about the RV or people wanting input on problems they were having. I am much better at building and dreaming up projects than I am typing behind my keyboard. If you want any more information please contact me. 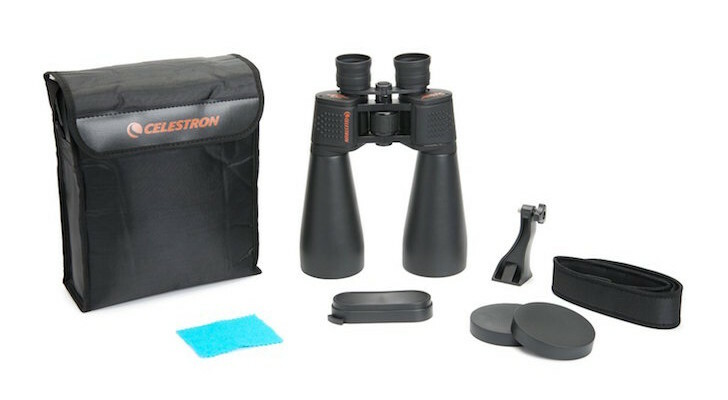 Great find! We will try to salvage what information we can and add it here for others to see. Unfortunately, we have tried to contact Chad several times and have not received a reply. We will keep our fingers crossed! What have you heard from Chad. His website is still down. What about contact info for him?